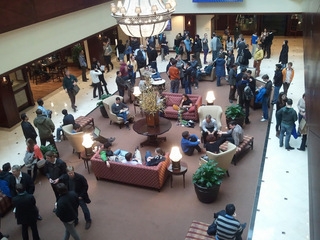 Feb 28–Mar 5 was the 10th COSYNE meeting, and my 6th participation. Thanks to my wonderful collaborators, I had a total of 4 posters in the main meeting (Jonathan Pillow had 7 which was a tie for the most number of abstracts with Larry Abbott). 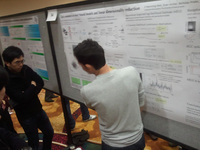 Hence, I didn’t have a chance to sample enough posters for the first two nights (I also noticed a few presentations that overlapped NIPS 2012). 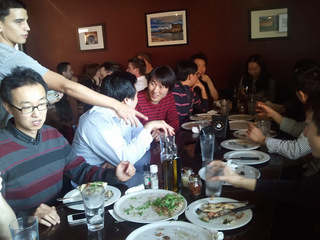 I tried to be a bit more social this year; I organized a small (unofficial) Korean social (with the help of Kijung Yoon), a tweet-up, and enjoyed many social drinking nights. Following are my notes on what I found interesting. William Bialek. Are we asking the right questions? She stressed about how there could be multiple implementations of the same functionality, a property she refers to as degeneracy. Her story was centered around modeling the Lobster STG oscillation (side note: connectome is not enough to predict behavior). Since there are rapid decay and rebuilding of receptors and channels, there must be homeostatic mechanisms that constantly tune parameters for the vital oscillatory bursting in STG. There are multiple stable fixed points in the parameter space and single cell RNA quantification supports it. Using optogenetics in a behaving mice, they tried to resolve the synchrony vs rate code debate. He showed that behaviorally, the population showed almost perfect integration to weak input, and not sensitive to synchrony. Hence, he claims that the brain may just well operate on linear population codes. Spike trains from monkey area LIP were used for an “eye-movement intention” based brain—machine interface. During the brain–control period, LIP neurons changed their tuning. Decoding was done with a MAP decoder which was updated online through the trials. To encourage(?) the monkey, the brain–control period had different target distribution, and the decoder took this “behavioral history” or “prior” into account. Neurons with the lowest performance enhanced the most, demonstrating the ability of LIP neurons to swiftly change their firing pattern. Estimation of latent dynamics with arbitrary noise process is recovered from high dimensional spike train observation using low-rank optimization techniques (convex relaxation). Even spike history filter can be included by assuming low-rank matrix corrupted by sparse noise. Nice method that I look forward for its application to real data. I had hard time understanding the speaker, but it was interesting to see how spike count correlation and Gaussian assumption for decision making could accurately predict the choice probability. Due to large concentration in the eigenvalues in stimulus covariance natural scenes, they show that spike triggered covariance analysis (using the difference between the raw STC and stimulus covariance) result contains a spurious component that corresponds to the largest eigenvalue. They claim this using random matrix theory, and proposed a correction by projecting out the spurious dimension before STC analysis, and surprisingly, they recover more dimensions with larger than surrogate eigenvalue. I wonder if a model based approach like GQM (or BSTC) would do a better job for those ill-conditioned stimulus distributions. It is well known that the Fano factor of spike trains is reduced when stimulus is given (e.g. Churchland et al. 2010). Gergo measured contrast dependent trial-to-trial variability of V1 membrane potentials in awake mice. By computing the statistics from 5 out of 6 cycles of repeated stimulus, he found that the variability is reduced as the contrast gets stronger. The spikes were clipped from the membrane potential for this analysis. Jakob H Macke, Iain Murray, Peter Latham. How biased are maximum entropy models of neural population activity? This was based on their NIPS 2011 paper with the same title. If you use maximum entropy model as an entropy estimator, like all entropy estimators, your estimate of entropy will be biased. They have an exact form of the bias which is inversely proportional to the number of samples, if the model class is right. By taking a limit of small bin size of an RBM, they built a point process model with continuous coupling with a hidden point process. The work seems to be still preliminary. They used Gaussian process to constrain the coupling to be smooth. D. Acuna, M. Berniker, H. Fernandes, K. Kording. An investigation of how prior beliefs influence decision–making under uncertainty in a 2AFC task. Subjects performing optimal Bayesian inference could be using several different strategies to generate behavior from the posterior; sampling from the posterior vs MAP inference are compared. Different strategies predict the just-noticeable-difference (JND) as a function of prior uncertainty. However, they find that human subjects were consistent with MAP inference and not sampling. He poses the question of whether activities in the motor cortex is a representation (tuning curve) of motor related variables or the motor cortex is just generating dynamics for motor output. Also, he says jPCA applied to feed-forward non-normal dynamics shows similar results to Churchland et al. 2012: not necessarily oscillating. He suggested that dynamics is the way to interpret them, but the neurons were after all also tuned in the end. By studying the thalamic input to the cortex in a sedated animal, he discovered that they synapse 80% to layer 4 and 20% to layer 5/6 (more 5 than 6; see Oberlaender et al. 2012). He blocked the L4 and above activity which did not change the L5/6 membrane potential response to whisker deflection. He suggested that L1/2/3/4 and L5/6 are two different circuits that can function independently. Eero presented an elegant theory (work with Deep Ganguli presented in NIPS 2010; Evan’s review) of optimal tuning curves given the prior distribution. He showed that 4 visual and 2 auditory neurophysiology and psychophysics can be explained well with it. Among the place cells there are also silent neurons in CA1. Using impressive whole cell patch on CA1 cells in awake freely moving mice, he showed that not only they don’t spike, the silent cells do not have tuned membrane fluctuation. However, by injecting current into the cell so that it would have a higher membrane potential (closer to the threshold), they successfully activated the silent cell and and made them place cells (Lee, Lin and Lee 2012). She used intrinsic imaging to find continuous retinotopical maps. Using the gradient of the retinotopy, in combination with the eccentricity map, she defined boarders of visual areas. She defined 9(or 10?) areas surrounding V1 (Marshel et al. 2011). Several areas had temporal selectivity, while others had temporal selectivity, which are the hallmark of parietal and temporal pathways (dorsal and ventral in primates). She also found connectivity patterns which showed increasingly multi-modal for higher areas. Thanks!! I wish I could’ve gone this year, but at least I know the highlights now. Your summary is excellent as always Memming. Congrats on 4 posters, very cool!